Almost two months ago, the High Court ruled that offshore detention on Nauru and Manus Island was lawful. The 267 people who had been brought to the mainland, and who had been part of that case, were liable to be sent back. Baby Asha, with her parents, arrived in Brisbane for treatment for burns suffered on Nauru just before the High Court decision. They were liable for return after the burns were treated at Lady Cilento hospital. In the week before she was released, Serco did make one attempt to remove Asha and her mother from the hospital for return to Nauru. But after a week long stand-off at the hospital in Brisbane, they were released into community detention. None—not one—of the 267, nor baby Asha and her parents, have actually been moved offshore. 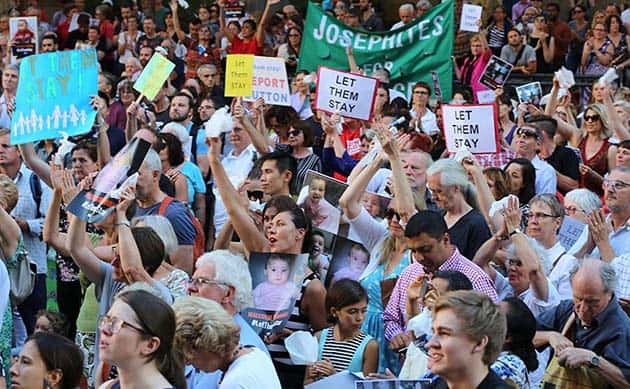 Every day that passes makes it more likely that the 267 will stay; and every day they are kept in Australia is a win for the “Let Them Stay” campaign. The stand by the doctors and staff at the Lady Cilento, backed up by the hundreds of supporters who maintained the week-long vigil, has shifted the campaign against the government. Every selfie action and resolution gives confidence to the staff of the next hospital to take the same stand when the time comes. Although the government still warns the asylum seekers that they will be sent back, slowly, but surely, more of the 267 are being released into community detention. This means the government has declared residences outside a detention centre to be “places of detention”, and stipulated conditions that apply to living there. People in community detention are not allowed to work. Although they are usually relatively free to come and go, sometimes there are curfews and even guards in place. On 13 March, hundreds more people took part in non-violent direct action training at churches across Australia, in preparation to physically defend asylum seekers seeking sanctuary from deportation. There are growing numbers—a majority now—supporting the Let Them Stay campaign. Increasingly the discussion is about how can we make it impossible for the 267, or anyone else, to be sent to Nauru or Manus Island. Deepening the movement, building local and workplace-based groups, can qualitatively transform the campaign. Wider layers are being actively drawn into the campaign—a Let Them Stay selfie initiative by one union delegate at City of Sydney Council spread across different departments. The “No Pride in Detention” float supporting gay refugees Nima and Ashkan on Nauru reached many thousands more, and will be the basis of a contingent at the Palm Sunday rally. The news that another two refugees transferred from Nauru to Cambodia had gone back to Iran exposed that the government has no resettlement arrangement from Nauru. The bashings and the rapes starkly reveal that Nauru is not safe. The Iranian Foreign Minister has once more said that Iran will not accept asylum seekers being forcibly returned. Now the 490 Iranians in closed and community detention must be released.